Sew up mini Christmas stockings for all your little gifts this year! These are perfect for using up fabric scraps and for filling with holiday treats, gift cards, and other small items. My mini Christmas stockings have a fluffy cuff and flannel applique patches on the heel and toe - mixing textures like that gives so much interest! But you can make them as simple as you like by mix and matching the templates until you have just the pieces you want. These mini holiday stockings are approximately 6 1/2’’ tall and 5 1/2’’ wide. 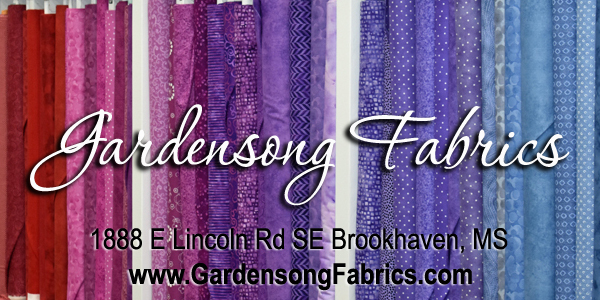 The main fabrics I used are from the collection Kringle’s Sweet Shop from Blend Fabrics. See my unbundling video here. Click here to download the free pattern templates. Trace the 2 applique pieces to the back (paper side) of the fusible web for applique. Cut out. Fuse to the back of the applique fabric and cut out the fabric shapes with fusible web on the back. 1. Sew the cuff piece to the top of the front piece with a 1/4’’ seam allowance. 2. 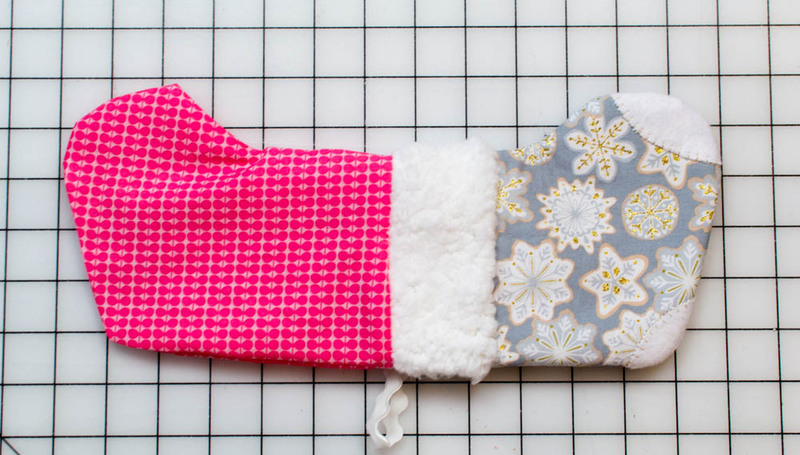 Fuse the fusible fleece interfacing to the back of both stocking pieces. 3. Fuse the heel and toe applique pieces to the stocking front. Sew in place (using decorative thread, if desired). 4. Place the stocking pieces right sides together and sew around the sides and bottom edges with a 1/4’’ seam allowance. Cut notches (or use pinking shears) around the outer curves. Make small clips into the inner curve. Turn the stocking right side out and press gently. 5. If desired, fold the 6’’ piece of trim or ribbon in half and baste the raw edges together at the top of the stocking - on the back above the heel. 6. 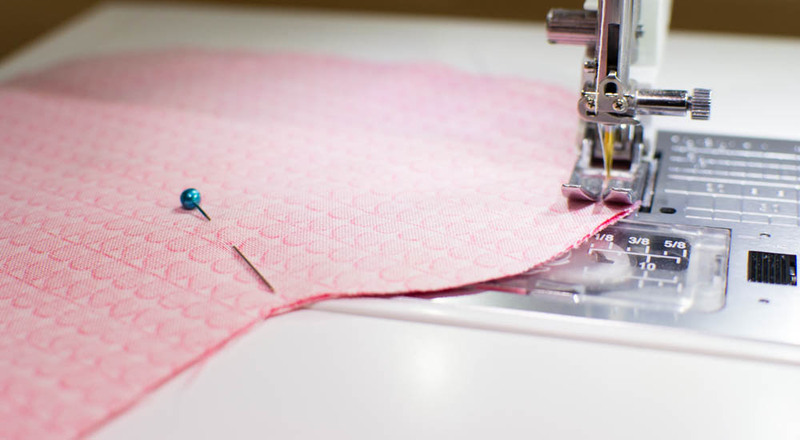 Place the two lining pieces right sides together and stitch with a 1/4’’ seam allowance. Leave a 3’’ opening at the bottom for turning. 7. With the stocking exterior right side out, place the lining over it (right sides together) and pin the top edges together. 8. Sew around the top edge with a 1/4’’ seam allowance. Tip: when sewing small openings like this, I will often sew from the inside instead of trying to fit it on my sewing machine’s free-arm. 9. Turn the stocking right side out through the opening in the lining. Press the edges at the opening to the inside. 10. Sew the opening closed either by hand or by machine. Push the lining down inside the stocking and you are done! 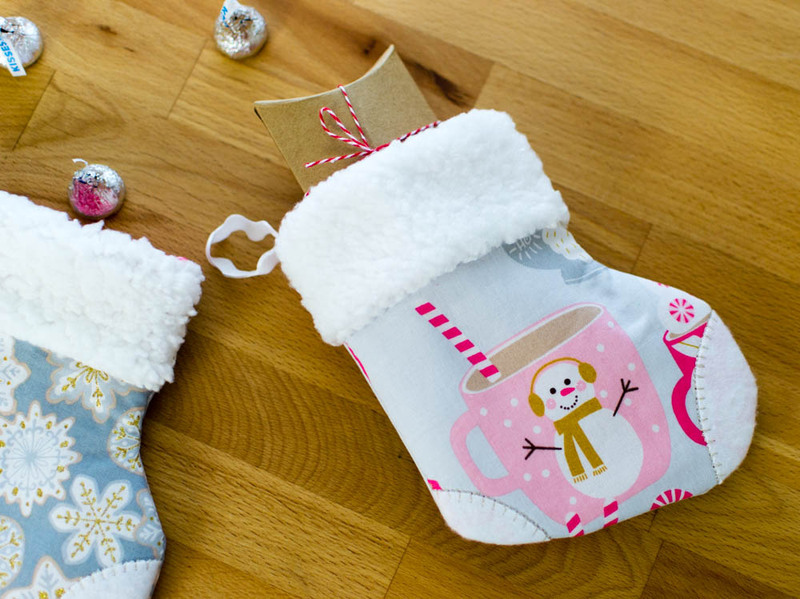 Now use up all your Christmas fabric scraps making these adorable little gift-givers! P.S. You might also like my Christmas Stocking Zipper Pouch pattern & tutorial.